Fleetwood captain Nathan Pond says Town cannot concede goals in the manner they did at Rochdale if they want to carry on improving. Town were fourth and Rochdale rock-bottom before kick-off at Spotland but Town slipped to seventh with a 2-1 defeat. 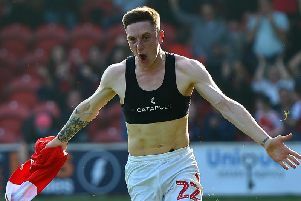 Dale’s goals came in near identical fashion from left- wing crosses as Matthew Lund and then substitute Steven Davies rose at the back stick to nod home. Pond says Town were not up to their normal standards but will be raring to go at home to MK Dons on Saturday. The skipper said: “It was a poor performance. We started sloppily and paid the price as we were 1-0 down. “We got back into it with the penalty and the second half was a bit better, but from our point of view we conceded two poor goals. “The second has come from a goal-kick – two duels, 50/50s and they have come out on top. “I think (keeper) Chris Neal has misread the cross and (it’s) a free header again, which we can’t allow at this level. If we want to improve we can’t concede goals like that. “We have been on a good run of form and confidence has been high. We knew Rochdale were bottom but we knew what sort of a team they are on paper. “They are a good footballing side and they showed that. They did not give us a second of space. Pond revealed that head coach Uwe Rosler called the players in on Sunday to watch the previous day’s first half. The skipper said: “The lads were very disappointed. We let ourselves down.